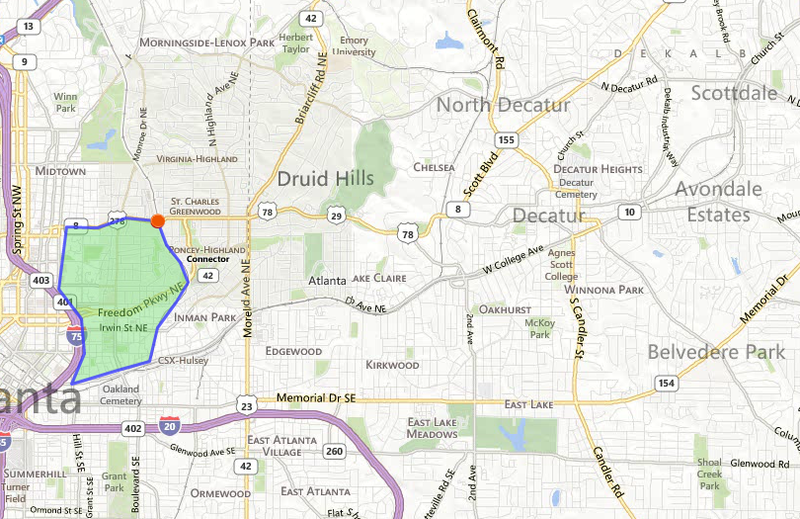 Settled in the early 1800s, Old Fourth Ward is an Intown Atlanta neighborhood with a great deal of history. The birthplace of civil rights leader, Dr. Martin Luther King, Jr., it is the site of the Martin Luther King Center and Memorial Park, King’s own Ebenezer Baptist Curch, and the Sweet Auburn Historic District. Looking for a home in Old 4th Ward? Click HERE to search for Old 4th Ward homes for sale. Located just east of downtown and north of Cabbagetown, Old Fourth Ward is a neighborhood that has been highly focused on redevelopment and renewal. In just a few years, with the revitalization of Edgewood Avenue, City Hall, and the King Historic District, along with the addition of the Atlanta BeltLine and the Old Fourth Ward Skate Park, Old Fourth Ward is now considered to be one of Atlanta’s “hippest” areas by residents and visitors alike. During the day, singles and families can be seen enjoying the newly-completed Historic Fourth Ward Park which encompasses 17 acres of new green space, a two-acre lake, playground, a state-of-the-art splash pad, an outdoor theater, athletic field and a world-class skate park. At night, with some of Atlanta’s top restaurants, bars and hot spots located in the neighborhood, residents enjoy an assortment of excellent dining experiences and an active night life. And, nowhere is community pride more evident than in the Old Fourth Ward as residents support local events like the Georgia Marathon, the Old Fourth Ward Arts Festival, Sweet Auburn Springfest, and One Musicfest. Real estate in Old Fourth Ward ranges from Craftsman bungalows built in the 1920s (after the fire of 1917), brick and cottage-style homes, shotgun houses, and Victorian homes (either recently restored or ready for some TLC). Lofts and condominiums are also available in some of the area’s older refurbished industrial buildings. Listings on this website come from the FMLS IDX Compilation and may be held by brokerage firms other than the owner of this website. The listing brokerage is identified in any listing details. Information is deemed reliable but is not guaranteed. If you believe any FMLS listing contains material that infringes your copyrighted work, please click here to review our DMCA policy and learn how to submit a takedown request. © 2019 FMLS. Data last updated: 4/25/19 5:49 PM PDT. Walk Score provided by walkscore.com.